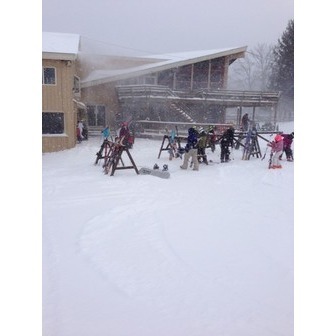 Voted "Best Downhill Skiing in the Berkshires" in the 2010 Berkshire Eagle Readers poll, Bousquet rests on the edge of the city of Pittsfield, in the beautiful Berkshire Mountains of Western Massachusetts. Bousquet's Snowsports School is known for its professional, dedicated, and knowledgeable instructors that will provide you and your children with an experience of a lifetime. Five U.S. Olympic downhill skiers have evolved from the Bousquet Race Team including Heidi Voelker and Kim and Krista Schmidinger - all honing their skills on Bousquet's diverse terrain. Our Mountain Operation team is dedicated to grooming, snowmaking and creating top-notch terrain parks with features to challenge you on the snow. Bousquet's staff offers warm hospitality and a family friendly atmosphere making Bousquet your #1 choice for fun in the Berkshires. In the summer Bousquet is home for endless summer fun in the Berkshires. Families love our six waterslides and activity pool for younger kids. Last summer, adventurers discovered the joy of soaring through the sky on our brand new zip line with two sections totalling over 700 feet. The excitement continues this summer with Bousquet's Berkshire Adventure Park. The Adventure Park consists of challenging ropes, bridges and balancing features hovering over the ground at up to 30 feet high. When your feet are back on the ground you can enjoy classic activities like our go-karts, 18-hole mini-golf course, bungy trampoline, climbing wall, bounce castle and more. Bousquet is where families in the Berkshires find their affordable summer fun!